After my second day in Harrisburg where I was attending a conference, I met up with my friend Ashley in Duncannon. We got a bite to eat and decided to hike up to Hawk Rock. There were several Appalachian Trail thru-hikers in town, including the same group I saw the day before at Pine Grove Furnace. Other thru-hikers were checking their smart phones or picking up packages. We began the climb up to Hawk Rock between thickets of wineberries and jewel weed. The weather was incredibly humid, so much so that my glasses fogged up. We passed a thru-hiker coming off the mountain with a dog. He was clearly in pain, his feet were hurting him. Thankfully he was close to town. We left the Appalachian Trail and took a side trail that snaked steeply up the mountain. 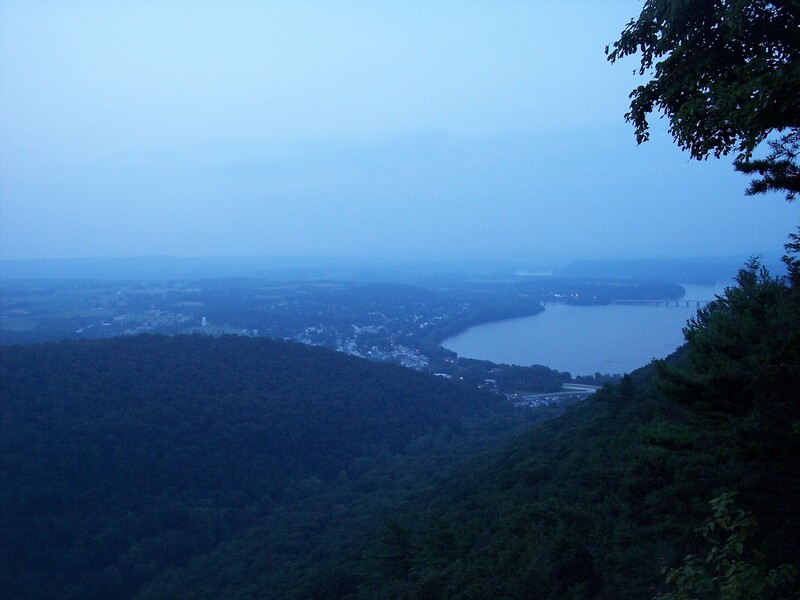 We reached a fine view of the vast Susquehanna River and Peters Mountain. Haze consumed the distant ridges. We continued the steep climb, but soon we reached the top and the trail leveled along the crest of the ridge. We saw someone ahead; it was another thru-hiker who was camped where this side trail met the AT. We said hi and continued up the AT. Little did we know Hawk Rock was to our right, as we beared left, heading south on the AT. It was a nice trail, with deep woods and rock outcrops as the setting sun glowed through the trees. We decided to turn around as twilight began to descend. We returned to the side trail and the camping thru-hiker. I gave him some granola bars and crackers, which he appreciated. His trail name was “Quattro” and he had also hiked the trail in 2007. He was friendly and seemed to enjoy the culture and friendships of the trail, saying the people were the best thing on the AT. He also seemed to have a transient nature to him; when we asked where he was from he hesitated and said Key West. It is hard to imagine all the different lives people lead. We said goodbye and descended immediately to Hawk Rock. It was growing dark as the lights of Duncannon twinkled in the distance. Shermans Creek flowed through a gorge far below. We left the view as the trail descended from the ridge; the narrow path clung to the side of the steep mountain. The trail passed large talus slopes and the forests became pitch black. By the time we reached the final descent to the road, we couldn’t see anything as we picked our way down the rocks with our hiking poles. We failed to bring headlamps, so Ashley illuminated our way with her cellphone. The road finally came into view as we made out of the forest’s cloak of darkness. The Pole Steeple is a rather odd name for a prominent rock outcrop in the Michaux State Forest, near Pine Grove Furnace State Park. 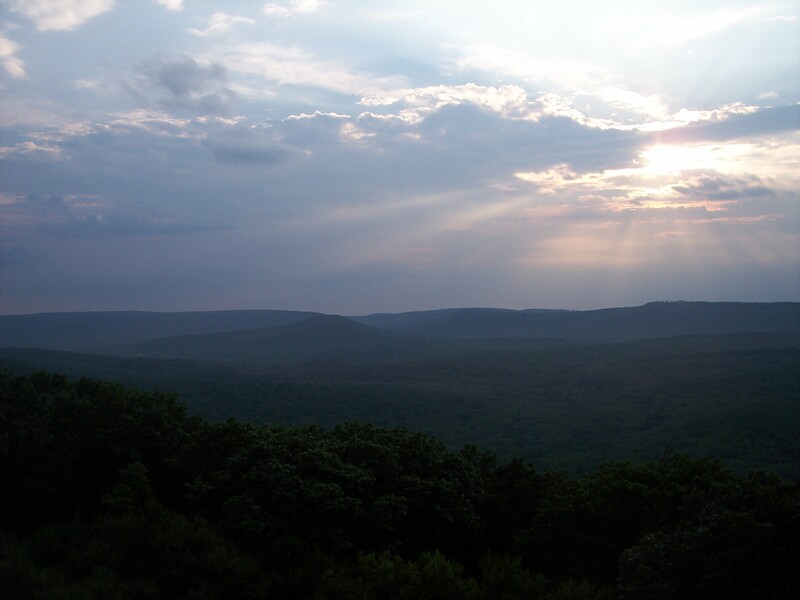 Located just off the Appalachian Trail, the Pole Steeple is a popular hiking destination as it looks over the beautiful wooded valleys and rolling mountains of the state forest. I was in Harrisburg recently for a seminar. After I was done for the day, I decided to do some exploring. After a forty minute drive I found myself in Pine Grove Furnace State Park. It was late afternoon. I parked near the park store where several thru-hikers were attempting the half-gallon ice cream challenge, a tradition among the Appalachian Trail hikers. A few of the hikers were struggling; others were keeping time. One finished his half-gallon after 30 minutes or so. I was soon on the trail as it explored woodlands along a stream and passed a small pond. The trail followed the creek more closely where I passed another thru-hiker, this one heading south. I passed a young family who were going for a hike. 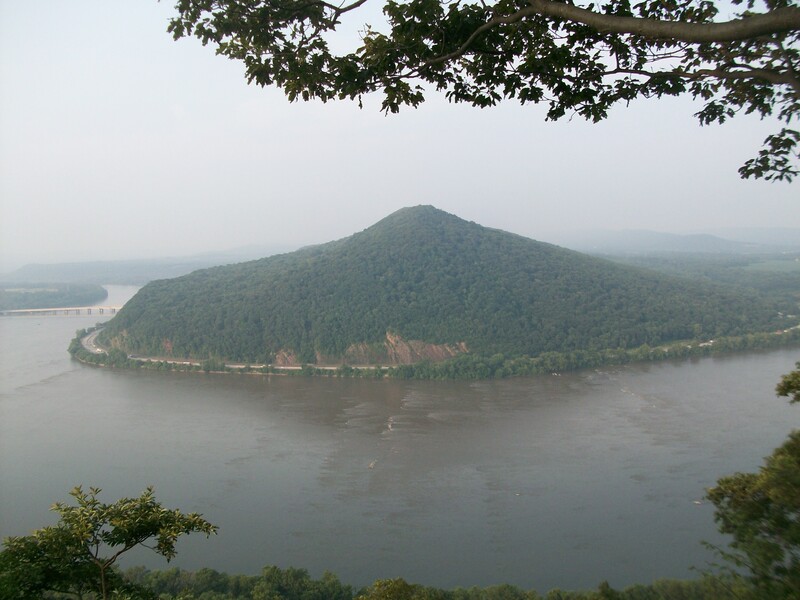 The Appalachian Trail began a gradual ascent up the mountain. I was making good time, but the humidity could not be avoided as sweat stained my shirt. I passed several campsites, empty of people. On the ground at one campsite, someone wrote “1,100”, indicating they were about half-way along the trail’s 2,200 plus miles. The trail leveled off and I took a side trail to the Pole Steeple. A steep climb brought me to the outcrop and I was treated to beautiful views. I also had it all to myself. Shafts of sunlight spliced the clouds at the horizon. I sat and enjoyed the view as a thunderstorm passed to the south. Laurel Lake was far below. A faint veil of mist began to spread across the valley. I retraced my steps and came across a small pack of cub scouts climbing the trail to the view. The kids seemed so small to be hauling packs so big, but they all seemed happy. I said “hi” and one kid exclaimed to me, “We’re camping!” I said “Good for you! Have fun.” “I will!” came the confident reply. I soon disappeared into the twilight of the forest and could hear the kids’ excitement when they reached the view. I returned to my car in darkness. The thru hikers were gone, on their journeys both north and south. The famous Loyalsock Trail stretches for almost 60 miles through the Endless Mountains. It is famous for its vistas, waterfalls, and beautiful streams and has been recognized by Backpacker magazine as being one of the finest hikes over 50 miles in length in the country. I was recently able to hike the 13 miles of the eastern end of the trail, between Mead Road and Worlds End State Park. This is a particularly scenic section of trail. Ed and his nephew Ben joined me. It was a hot, humid morning as we pulled into the parking area, but it proved to be much cooler in the shade of the forest. As we began the hike, we passed a young family with several small kids, about to enjoy a day along the trail. With recent rains, the creeks were running well and Dutchmans Falls provided a nice display as it tumbled over some cliffs into the Loyalsock Creek below. The forest was beautiful, as shafts of sunlight penetrated the canopy, illuminating mist that hung across the forest floor. The trail stayed close to its namesake creek, offering great hiking. We soon reached one of the highlights of the trail, the Haystacks. 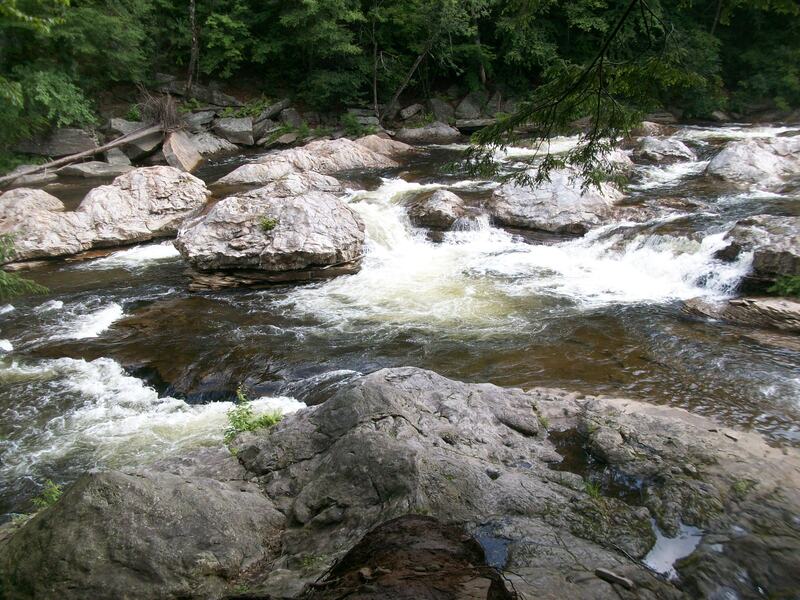 The creek roared with rapids as it twisted around the maze of white boulders. It was a gorgeous sight. We had the place to ourselves as we got a bite to eat. The trail climbed to an old railroad grade where we passed a few dayhikers intrigued by a wet-weather waterfall. The trail followed the easy grade before descending back to the Loyalsock Creek, where it crossed a bridge. A climb followed up along a small stream, where we passed some odd looking rock outcrops with small caves, a product of erosion. Ben was impressed by the outcrop; I had seen it before, but for some reason, it did seem more interesting on this hike. We hiked along cliffs and ledges and soon reached beautiful Sones Pond, where we ate lunch. The water glistened in the bright sunshine as we sat in the shade of the hemlock forest. The trail meandered through a beautiful forest of hemlock and ground pine, passing over creeks. It was a great section of trail. We passed three backpackers, who seemed to enjoy the trail. The diversity of the forests was impressive as the trail explored hardwoods, meadows, streams, wetlands, and deep hemlocks. At Tamarack Run, the creek twisted into tight “S” curves creating peninsulas and pools that reflected the trees. We soon reached Alpine Falls as it tumbled down its grotto of cliffs. Sunlight speckled the forest floor as a soft breeze blew up the glen. The trail passed a beaver meadow with tunnels of hemlocks that Ben and Ed enjoyed. We soon reached High Rock Run where there was some flagging, I hope it wasn’t a sign of gas drilling on our public lands. 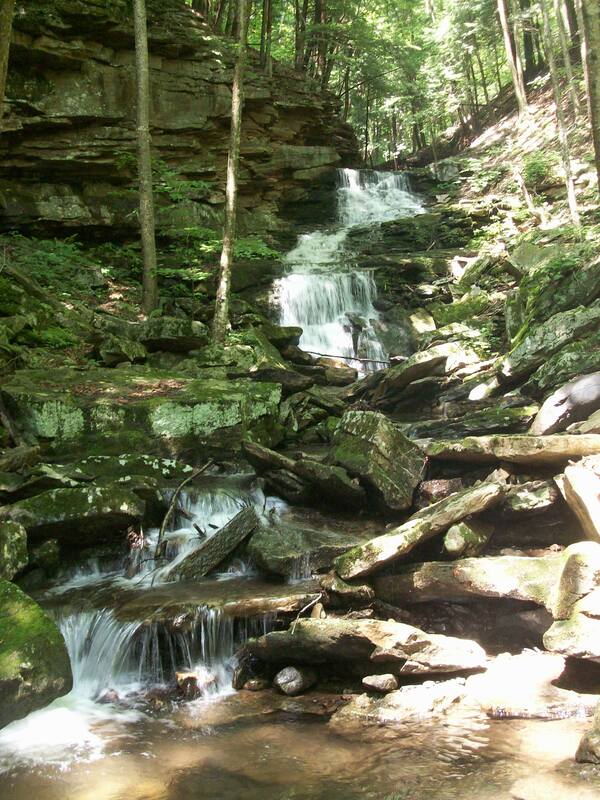 The trail descended to Worlds End State Park along High Rock Run with its cascades. We soon reached the park and a nice view. The park was filled with people swimming, having a picnic, or relaxing. There are few better ways to spend a hot summer day than at Worlds End. Ed and Ben enjoyed the colorful, spring stained cliff at High Rock and High Rock Falls as it plummeted from its secret grotto. We were soon back at the car for the ride home. Map of the section of the Loyalsock Trail we hiked.